Good Morning and Happy Valentine's Day!!! Well here it is, my first post as an Etsy Design Team member!! I'm so excited to be a part of this team and sharing my artwork with you and the wonderfully talented ladies of Etsy!!!! This week, Ashley picked JennyBunny's Shop as our inspiration and I chose the colors in the above earrings to base my card off of......don't you just love Kraft & Pink Pirouette together?!! I also used Laura's sketch from 2 Sketches 4 You---I love it, thanks Laura!! 2. Create your project--card, layout or 3D...all are welcome!! Make sure you check out the other Design Team members' blogs to see their creations and leave them some love!! Mark your calendars for the 28th! We're doing an all day blog hop with challenges & prizes and I KNOW you don't want to miss it!!!! Thanks so much for stopping by and have a great rest of the day!! Such a pretty card! 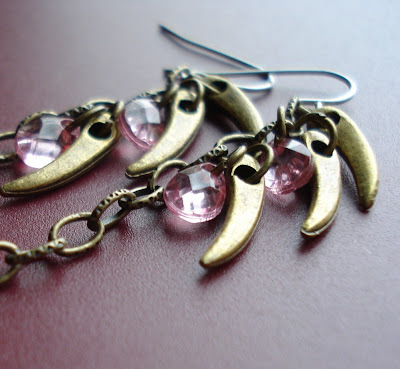 And stunning earrings! Off to check them out. Gorgeous card Jackie!! So glad to see you part of my favorite saturday challenge!! Hard not to find inspiration in those earrings! Love kraft and PP!! Too cool! You really did a great job putting it to paper! Beautiful card Jackie.. Happy Valentine's Day! This card is beautiful. What a great inspiration piece also. I love the ribbon behind the main layer on the card. That's a very nice touch. Your card is very very pretty and very SU perfect!!! Your colors are so soft and sweet!!! Love that stamp set again!!! Such a beautiful soft touch to the card! Jackie, yes, I do love the pink and kraft together. This card has such a soft feel. Lovely! The kraft and soft pink together are so pretty! Great card! Kraft and pirouette DO look great together. Gives such a soft and pretty feel. Wonderful card and great interpretation of the inspiration piece. Congrats on the design team position, Jackie!! Your card design is so lovely, pink is one of my favorites. GORGEOUS card !!! I love the colors !!!! Sooo beautiful !! Pretty! I do love the kraft/ pink pirouette combo! Whoohoo....congrats, Jackie on your new DT position!!! 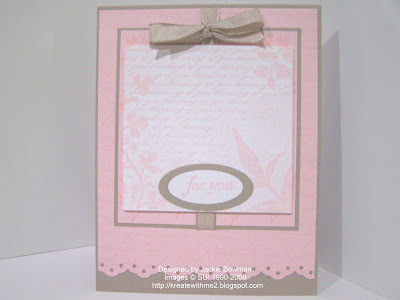 I just love your beautiful pink card....absolutely gorgeous!! !